The picture here (from his site) is of his own family’s arms, Or a bend gules engoulé vert between two wolves passant sable all within a bordure gules semy of saltires couped or. He has downloadable patterns and instructions for several different coats of arms on the site. 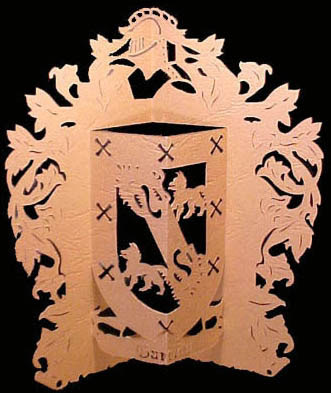 I don’t think I’ve ever seen this method of doing a coat of arms before, and find it fascinating. Hence, I pass this information on to you, in the hopes that you might find it interesting, as well. This is the bordure that the King gave to the knights that fought in the Baeza's battle. This kind of bend is very strange out of Spain, and there are a lot of wolves in the coat of arms of the north of Spain. Hi, Xavi! I did not know that this bordure was given by the King after the Battle of Baeza. Thnk you for that information. I find that I really like the bend engoulé; it is one of the things about the heraldry of Iberia that just seems to me to be a really "cool" charge.